Orthodox Church liturgical Oblation table vestments by Istok Church Supplies Corp. 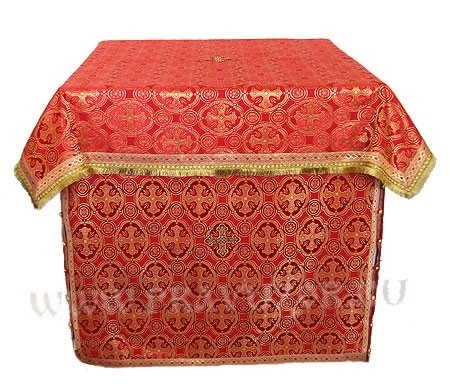 Among the incredible selection of Orthodox Church consumables that Istok Church Supplies offers, Oblation Table vestments supplies stand out for their majestic formality and lasting beauty. Although not very large, the Oblation Table has special place in Othodox liturgical tradition. After all, it is used for preparing the bread and wine for the Divine Liturgy. The tradition of preparing bread and wine is a sacred and important ritual, commemorating the Last Supper. It’s a reminder of the sacrifices made by Christ the Savior during his earthly life. The wine and bread itself are symbolic of Christ’s body and blood. Upon the table are placed the sacred vessels such as the chalice to hold the wine, the spear used for cutting Eucharistic bread, the spoon that is used for administering Holy Communion to the people and much more. Like the Holy Table, the Oblation Table is covered with a richly decorated ecclesiastical cloth. Our Orthodox Oblation Table vestments for sale are of traditional design and long lasting quality. The vestment for the Oblation Table must be tailored with excellent material. Our specialized craftsmen use high quality rayon and metallic brocade for this purpose. Working out of our premises in Europe, they have utmost concern for consistent quality. Our customers’ satisfaction is of illustrious importance to us. We guarantee that any Oblation Table vestment you choose will look lovely and enhance the prestige of your Church for years to come. The sacred tradition of partaking bread and wine is age old – going back to the time when Christ blessed us all with His Divine presence. Eucharist – the act of Communion – is one of the most important acts in an Orthodox Church. As devout Christians, it is our duty to glorify Christ the best way we can – at Istok Church Supplies, we do it by offering Orthodox oblation vestments supplies at reasonable prices.